There are a ton of different pet insurance plans you can choose from these days. Trupanion is one of the companies that are trying to set themselves apart from the rest, and updated all of their plans in 2013, making new “riders” available to compete in a busy industry. After the updates, the level of comprehensive accidental and illness coverage dramatically increased. However, Trupanion did not include wellness checks into their plans when they made revisions. With the addition of new “riders”, though, wellness checks can be added onto any policy for a small monthly fee. More Coverage: Trupanion offers some of the highest levels of coverage out of all of the companies we’ve reviewed. They boast covering “any” condition that isn’t pre-existing, even the conditions that your pet may currently have, but will be prone to. Flexibility: With Trupanion, you pick the plan that you want, and can add or remove different aspects of it to build the perfect policy for your pet. Easy Claims: When you file a claim, Trupanion will pay out directly to your vet so you don’t have to worry about paying any out of pocket expenses. They also boast that they will never punish you for filing claims. Won’t Raise Rates: Trupanion also will not raise your plan’s rates as your pet grows in age, or drop your coverage because your pet has an ongoing condition that requires multiple vet visits. No Hidden Exclusions: When you build a plan, what you see is what you get. There is no hidden exclusions or fine print that you have to worry about later in your pet’s life. Wide Range Of Coverage: Trupanion covers everything from medications and testing, to surgeries, hospitalization, homeopathic therapies, supplements, prosthetic devices, and even non-routine dental checkups. A huge problem with other companies is increasing your rates as your pet grows in age, or begins developing conditions and illnesses that require additional coverage. Trupanion will never increase your premiums -- unless you ask them to add additional riders. You also don’t have to worry about hitting a ceiling when it comes to filing a claim for the same incident, if the incident requires multiple visits to the vet. Trupanion offers unlimited lifetime coverage, so once your deductible is paid, your pet will be treated (and claims will be paid) until the condition is taken care of. Depending on how often you think you’ll be using the policy, you can choose your deductible, and have control over your monthly premiums based on the deductible you settle into. Most companies either disqualify pets with hereditary or congenital conditions, but Trupanion accepts pets even on the basic policy. Once your deductible has been covered, Trupanion will begin taking over the cost of any medications and supplements that your pet may need to stay healthy. Even non-routine dental treatments are covered on the basic plans. Most companies will automatically deny your coverage if your pet happens to have hip dysplasia. Trupanion, however, will cover your pet, with no limits on a “per-incident” basis. By paying out claims directly to your vet, Trupanion offers some of the fastest turnarounds out of all the companies we’ve reviewed. If you prefer to use homeopathic or other alternative therapies, the same level of coverage you would receive through a standard vet visit still applies. If you let someone else adopt your pet, they don’t have to worry about picking up a new policy that may be more expensive due to your pet’s increased age. Trupanion allows you to transfer your existing policy into another name, should your pet’s owner change. If you travel a lot, you’ll be covered through Trupanion. You can travel to both Canada, and Puerto Rico, and still receive the same level of coverage as you get in the United States. Because Trupanion has so much to offer, their rates are also some of the highest in the industry. Each pet that you enroll into a policy requires a $34.95 standard enrollment fee, so you should think about this cost as you’re buying a new policy -- especially for a multi-pet policy. Before you’re able to receive coverage for any illnesses your pet may have, you will be required to wait 30 days. Accidental coverage requires a 5-day waiting period through Trupanion. Trupanion also does not offer discounts if you have more than one pet, like some other companies on our list will do. If your pet is more than 14 years old, they will not be eligible for coverage through Trupanion. Unspayed and Unneutered pets are not eligible for coverage through Trupanion. If you’re considering buying a policy through them, it’s worth it to get your pet spayed or neutered. When it comes to changing plans, there could be conditions that were previously covered in your plan that will not be covered in the new plan that you’ve chosen. 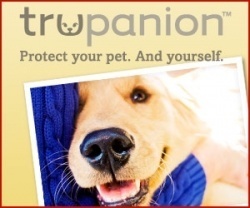 Trupanion is a solid pet insurance company. After your deductible and exam fee are paid, even with a basic plan, Trupanion will cover 90% of the actual bills for any illnesses or accidents that are included in the coverage on your policy. While this is among the highest in the industry, Trupanion isn’t necessarily flexible in terms of the reimbursement levels available. When you’re able to choose your reimbursement levels, you’re able to have more control over the monthly premiums. Trupanion has received positive feedback on how they pay out claims, as well as the level of customer service. They also cover hereditary and congenital conditions that most other insurers would deny policies and coverage for. Be aware of the pet enrollment fee when you’re considering Trupanion, because it is going to be an up-front cost. You should also note that the level of customization on the types of coverage you get through Trupanion is among the highest out of all the companies we’ve reviewed.